My objections to the 1911 as a carry gun have been: 1) it’s heavy, 2) it doesn’t hold as much ammunition, and 3) of the 3500 plus students I’ve watched shoot in our CHL qualification courses, the ones with the most Failure-to-Feeds (FTF), Failure-to-Eject (FTE), failure to go into battery and other types of malfunctions, have always been the 1911s. 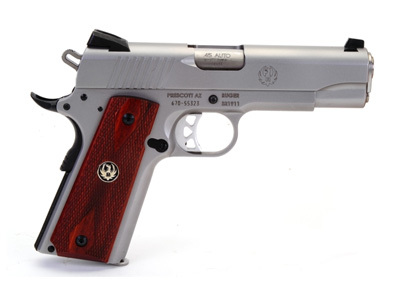 Even expensive 1911s like Kimbers and Colts. I have a nice Springfield Loaded and a Colt. My Colt failed to go into battery three times in one magazine full of ammo the last time I took it to the range. And it was factory ball ammo. Not something I’d want to trust my life to. But something happened recently that changed my mind and I only feel it fair to tell you about it. I got a Ruger SR1911 CMD, that’s a Commander-size, Stainless Steel 1911 made by Ruger. I got it to go with my collection of Ruger handguns that are stainless steel with walnut grips, various revolvers and Mark IIIs. Before taking it to the range, I took it apart to clean it and found that unlike some of the other 1911s I’ve struggled with getting apart and back together, this one came apart readily and went back together readily. The slide wasn’t a pain for me to work with my arthritic hands. At the range, I could see the sights with my 65 year-old trifocal-wearing eyes. I shot a 50 round CHL qualification series and ended up with a perfect score. I tried multiple types of ammunition, both FMJ and defensive ammo and couldn’t induce a malfunction. It feels good in my hand, aims naturally, and the trigger pull is light with no takeup. So that’s what the 1911 guys are raving about! Okay, why the Ruger and not the Springfield. I dunno. The Springfield is a very nice handgun. A little heavier, but in stainless steel, the difference between a 5-inch barrel and a 4 1/4 inch barrel is just not that much. The Ruger has a few non-expected niceties. The guide rod is the short GI rod, rather than the full-length rod used by some manufacturers. There is an adjustable trigger stop, which so far I haven’t needed. The mainspring housing is flat and made of steel. A small notch in the rear of the chamber serves as a visible chamber indicator so there’s no need for a press check to see if the gun is loaded. I decided to carry it for a day or two, just to say I’ve tried carrying a 1911. I thought within a couple of days I’d go back to my .45 ACP M&P with more rounds. I didn’t. With the M&P I have 11 rounds with 10 more in a spare magazine. With the Ruger I have 8 rounds with 8 more in an 8-round Wilson Combat Magazine backup. So 16 rounds instead of 21. That’s still 4 more (or maybe six more) than Roy Rogers had at his immediate disposal and he faced a lot more bad guys than I’m ever likely to face. It’s going on two weeks now and I’m still carrying the Ruger 1911 CMD on a daily basis. It’s like I finally drank the Kool-Aid and actually liked it! It’s going on three years now and I still love my Ruger Commander . . . and my Remington, and my Colt, and my SIG, and my S&W . . . who knows, there may be more. I actually think the 1911 is underrated, but not the Kimber. I’ve never seen a handgun fail to feed as often as a Kimber. Particularly failure to return to battery. Cost isn’t everything.